"OUR MISSION IS TO PROVIDE FAIR PRICES AND A SOURCE OF INFORMATION FOR BEGINNING AND ADVANCED COLLECTORS, INVESTORS, AND DEALERS OF NUMISMATIC ITEMS." Time to Liquidate your collection? Did you inherit a collection? Do you have some odds and end coin or currency laying around and your curious as the to the value? Stop by and let us take a look at what you have. We can give you a quick ballpark figure. Need an appraisal for your insurance company? We also provide appraisals! Call for current pricing on this. Looking for that special coin for somebody special in your life. (you included of course) give us a call or stop by! For a comprehensive listing of upcoming coin shows in the area click HERE. 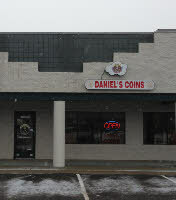 While Daniels Coins is not at every show, we do setup at many of them. Call us to confirm if we will be attending! We deal in ALL numismatic (money) items, including coins, tokens, paper money, and more. Let me help you build or liquidate your collection professionally. We are an old fashioned coin shop, we sell in store, and at shows only. We like to see you in person. Therefore we do not sell online.